Sonny has three main interests; cars, trains and dinosaurs. He seems to rotate these every few weeks or so but for the moment it’s dinosaurs. His interests aren’t just general likes, they become obsessional. Sonny lives it and breathes it. He stomps through the house like a dinosaur making impressive prehistoric noises and always carries at least two figures, one in each hand, wherever he goes. He loves nothing more than to watch dinosaur videos on the iPad and look through his dinosaur encyclopaedias (yes more than one.) He memorises them by name and recites every fact about them. He is the go-to boy for dino knowledge. Sonny always takes his dinosaurs with him, wherever he roams. Half term generally fills me with quite a bit of stress and anxiety and it’s not because the boys are at home. It’s because we struggle to find ways to spend our time together as a family. Most ‘normal’ families head to the park, soft play centres, splash parks, zoo’s and adventure playgrounds and have a brilliant time. For us and many other families with children on the spectrum, it can be our idea of a living nightmare. We have gotten to know Sonny’s triggers fairly well and try to avoid going places where we know we are setting him up to fail. Offers of gatherings with friends, picnics or trips out make the hairs on the back of my neck stand on end. For many a time, a well intended trip turns into complete and utter chaos. We end up leaving early with our tails between our legs, feeling embarrassed and frustrated at having spent money for an experience none of us were able to enjoy. 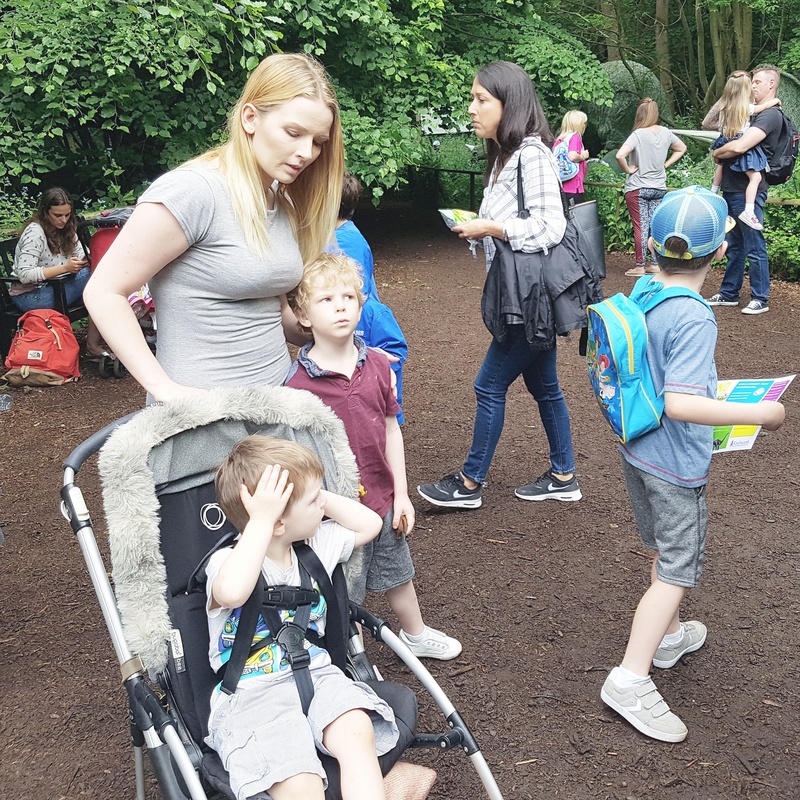 We daren’t go to busy places during school holidays, we tend to stick to woodland walks, strolls around lakes and canals or visits to family and friends.. Things most regular families do are just a lot harder for us. Sonny is still awaiting Autism diagnosis. His difficulties are mainly sensory based, triggered by crowds, loud noises, various textures and smells etc. He doesn’t do standing still or hanging around, all of which make popular outings quite the ordeal. We would likely experience our first meltdown while waiting in the queue to get in, so when we do go out during the holidays, every aspect is pre-planned. Military style. Sonny tires easily due to hypermobility so often swaps with his little brother and takes a rest in the pushchair. We pre-booked our tickets and had them ready to show at the gate when we arrived. We were winning from the start, no queuing to get in and with views of greenery in every direction. 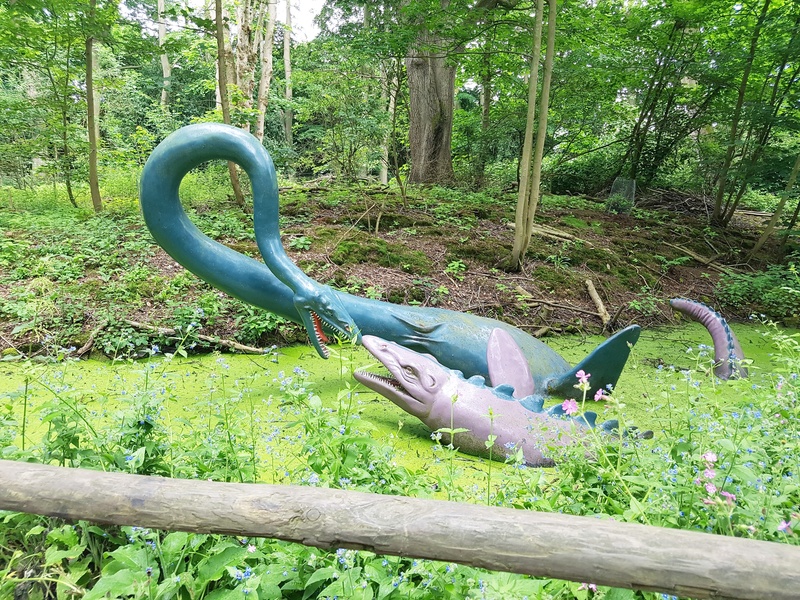 Sonny was determined to find all 72 of the life-sized creatures hidden in the depths of Knebworth and so we headed straight for the dinosaur trail. To get there, we walked through the maze which Sonny loved. It was pushchair friendly too which was a big help after initially struggling on the gravel stones outside the main entrance. I was worried Sonny might get a little claustrophobic but he thought it was brilliant and followed closely behind Riley and Joe. After discovering a few dead-ends, we finally found our way out the other side. Once past the maze, we followed the paths that led us to the dinosaurs. Sonny was amazed! The look on his face when he spotted a giant T-Rex in the distance was priceless. He knew all their names before I even caught sight of the named boards beside them. He told us all about what they ate and when they lived. Riley and Joe concentrated on filling in the activity sheet together. Sonny’s favourite dinosaurs are the Styracosaurus and Protoceratops. One of the things that helped Sonny cope with the number of people around him besides the fresh air and outdoor space, was the constant flow of people in one direction. We just kept moving, often looping back on ourselves to look for dinosaurs we may had missed. Their was excitement in the air, families and couples were having a great time, but it was tranquil. It had rained a little and Sonny at times became irate and upset by the mud on his shoes. There was so much to see, it wasn’t too long before something else had caught his attention. After seeing all the dinosaurs, we took a stroll through the gardens. Lots of children were climbing and rolling down the grassy hills. Sonny was too frightened of falling to have a try, not that it stopped the other two. The gardens at Knebworth are stunning. 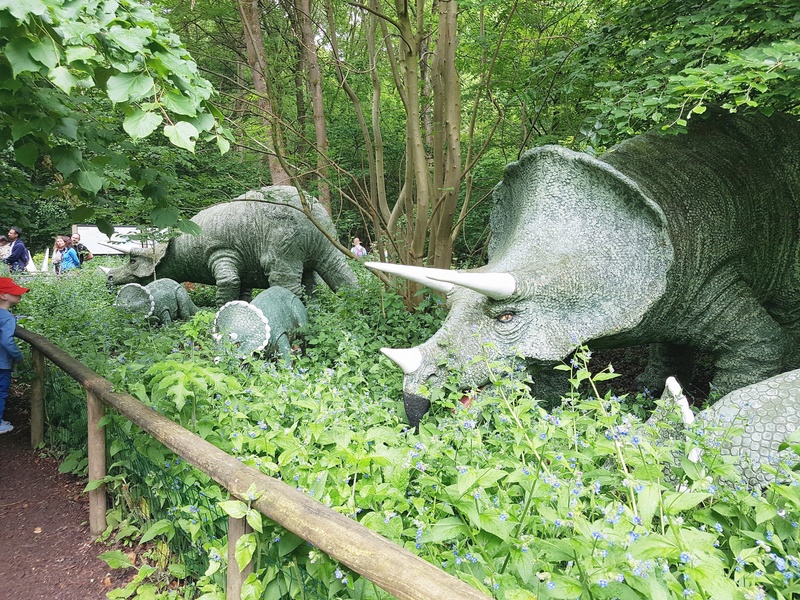 There is so much to see and do at Knebworth House, the dinosaur adventure playground is brilliant for all ages. A family ticket for four was only £34 with under 3’s going free! 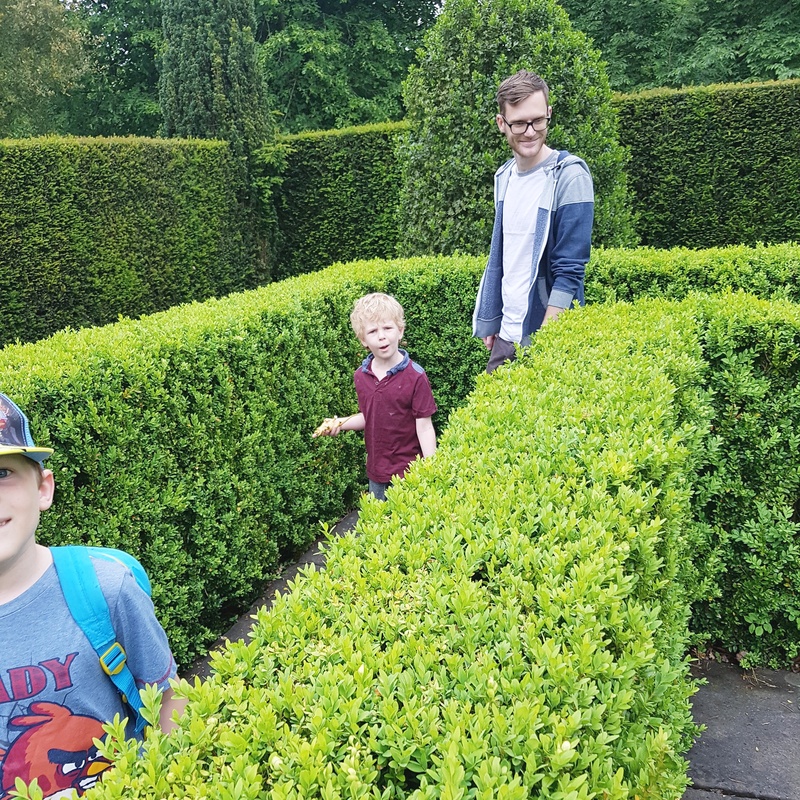 It’s not often we are brave enough to venture out as a family to places like these in fear of meltdowns but I am so glad we did. It’s given us the confidence boost we needed to go somewhere special and enjoy time together. We all had a brilliant time and can’t wait to go back!